BRDC MEMBERS RUN THE LONDON MARATHON! Among the tens of thousands of runners in Sunday’s Virgin London Marathon, the British Racing Drivers’ Club had 8 representatives running in support of Cystic Fibrosis. The BRDC team included some of the top young racing drivers in the country and they all banded together under their Club flag to raise a target of £50,000 for the Cystic Fibrosis Trust. Jamie Campbell-Walter, Peter Dumbreck, Stuart Hall, Richard Westbrook, Jonny Kane, Robin Liddell, James Matthews & Andy Meyrick stepped up to the 26.2 mile challenge to raise funds and awareness for this worthwhile charity. Oliver Gavin was racing in 2011 ALMS, Long Beach, California and ran his own marathon after his race! 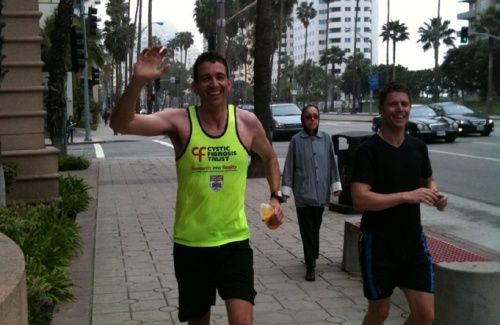 Johnny Mowlem ran the Marathon in aid of CLIC Sargent. To help with fundraising, the BRDC and runners hosted a Charity Lunch at Carpenters' Hall, London on Friday 15 April. A host of top names from British Motorsport attended including John Watson MBE, Mark Blundell, Johnny Herbert and Derek Warwick. Cystic Fibrosis Patron and TV presenter Ben Shephard did a fantastic job as compere for the afternoon. Together with the auction, led by James Knight at Bonhams, silent auction and pledges, guests were extremely generous and raised an astonishing £25,000. The runners had already raised approx. £15,000 on the JustGiving page (www.justgiving.com/BRDC-marathon2011) - the page is still open for donations! The whole team did fantastically well and you can see their finishing times on the above justgiving website.